Carry On is a fantasy novel about the Chosen One, Simon Snow, who must defeat the evil Humdrum; a being who seeks to destroy the magic world. This novel was a fun and easy read. The characters are very likable and Rainbow Rowell is a master of dialogue. The beginning is a bit boring compared to the rest of the book, however, once you get past that, it is hard to put down. If you love the Harry Potter series, you will absolutely adore this book. It is similar in that it will definitely satisfy your craving for Harry Potter, but also different enough to not make it seem as if it were a copy. This fantastic book is about two people, Meggie and Mortimer. If you think books are cool, just wait till you read this book, and you'll think the thought of reading aloud differently from now on. Mortimer is called a Silver Tongue. One who has super-cool powers to read stuff out from books. Hold on, bare with me, this evil man, Capricorn wants to destroy the book Inkheart(that was the book he was from) so no one could read him back to his past. One man though, Dustfinger, wants to go back into the book to his family, but soon finds out that if one person goes in, another comes out. That is what happened to Mo's wife. He was reading a book to Meggie when she was younger(Inkheart), and he read out these thugs and Capricorn. Soon to realize, his wife was gone. It was amazing! I could so write more on what happens, but for now, please read this. You'll love it. Anyone could read it. The author also wrote many other good books, and this one is the start of a three-book series. The first is always my favorite. Pretty please read this book and write a review! EVERYONE should DEFINITELY read this awesome tale! In the next book of the series, Wings of Fire, a two-thousand year old NightWing named Darkstalker has risen from his prison, where he had been buried by his best friend and forever sweetheart. Now he is out and free, rampaging all around Pyrrhia for revenge and world-conquering time. Only six dragonets stand in his way: Kinkajou, Moon, Anemone, Winter, Turtle, and Qibli. This story stars Qibli, a SandWing, while he battles Darkstalker in ways he would never have guessed, face his darkest fears, and battle himself from within. I was really impressed with this book because the plot is so well thought-out and the characters really well developed. It's also really fascinating to be inside Qibli's brain--he is always thinking at high speeds--because he can read dragons like a scroll and it's interesting to know what he reads off them. Also the book puts fundamental morals into play, and questions the gray areas. Its really cool to read about how Qibli and his friends battle and defeat Darkstalker, because it's a way you would never expect, nor see coming. Ten, a 17 year old girl, has been locked away inside Prynne Asylum for 13 months. Ten has been pressured her whole life into choosing between Troika and Myriad, two polar opposite afterlife realms who are fighting for her soul. She manages to escape the asylum and has to remain on the run to stay alive. She must then decide where to spend the rest of eternity in Troika of Myriad. I really liked this book. It kept me on the edge of my seat with excitement. This book has action, adventure, and romance. This book has a shock around every corner. If you like adventure and a thrill then you would fall in love with this book. You will not be able to put this book down. 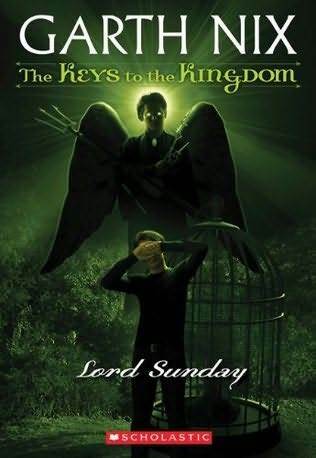 Lord Sunday is the conclusion to a seven-book series, where Arthur Penhaligon has to save Earth, and the new world he was thrown into. He has defeated most of the people in his way, and Lord Sunday is the last one to remain. He is also the strongest, and Arthur finds him to be the most difficult to defeat. The ending of this book is a major twist from what was expected, and leaves you wondering what happens next. I liked this book very much, because it was exciting to read, and made you feel like you were actually there. There was also a lot of suspense and surprises throughout, which made it interesting to read. I would recommend this to others who like to read suspenseful books, and enjoy plot twists near endings. People who like books who leave you thinking would enjoy this as well. The ending is a bit sad, so if sadder endings aren't for you, you might not like this book.